Before we put the Benito Acosta issue to bed for once and for all, here's a little bit of information for you to chew on. My position has always been that Mansoor treated Acosta differently than he treated his Minuteman pal, Jim Gilchrist, that evening. He permitted Gilchrist to speak longer than the three minutes permitted to each speaker and he allowed Gilchrist to have his 5 dozen or so sycophants in the audience that night stand to be recognize. Despite what our municipal court jester, Eric Bev er, says, those folks were permitted to stand to show support. Thirty minutes later he refused to permit Acosta to do the same thing, cut his speaking time by thirty seconds and had him dragged from the court in a headlock. That clearly demonstrated a bias against Acosta. Now, even though Mansoor has told the press that his actions that night were not personal, I really find that hard to believe. One month earlier Acosta stood at the speaker's podium and called Mansoor a "f***ing racist pig" - an epithet that was unacceptable and should have resulted in him being escorted from the auditorium at THAT time. Had I been Mansoor on the night of January 3, 2006, that event certainly would have been on my mind as Acosta once again stepped to the podium. I do not believe it wasn't on Mansoor's. Today, over at the Orange Juice blog, occasional writer Duane Roberts provided us with yet another bit of perspective on this whole subject. 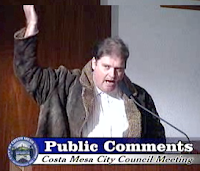 Roberts had been a frequent speaker before the Costa Mesa City Council during those tumultuous times. He was one of many folks who stood and told the council they were wrong for closing the Job Center and for what appeared to be a program of making life miserable for the Latino population in our city. SAME ACTION, NO REACTION - WHY? 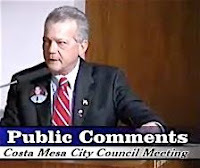 One month after the Acosta incident - three hours into the council meeting of February 7th, 2006 - Roberts stood before the council and, after a short commentary on the First Amendment to the Constitution, asked those who supported the right of free speech to stand and be recognized, which they did. Mansoor did nothing at all to stop him, only admonishing him to speak to the council. If Mansoor's behavior a month earlier with Acosta was appropriate - and the jury this week apparently thought it was - then Roberts should have been ousted from the speaker's podium and dragged from the audience. You can read Roberts' essay on the Orange Juice Blog HERE. WHAT IS THE DOLLAR COST? The only remaining question I have now is just what did this whole thing cost the city in attorney fees and related costs. Perhaps Kim Barlow will inform us soon.